on New Pups page & he is ready to go. family dogs and watch dogs. At Rising Creed Boxers, you will find beautiful puppies of great personalities and colors. Look through our pages to see what we have. 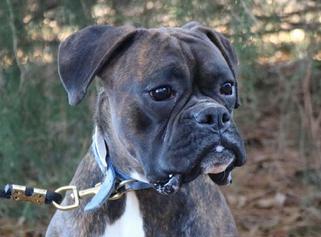 We, at Rising Creed Boxers, near Jack, Alabama are a responsible AKC boxer breeder. If you are looking for a good AKC boxer breeder, you have come to the right place. We are active in Southeast Alabama Kennel Club. We spend a lot of time with our boxers to keep them socialized and work with them on training to expose them to a lot of challenging but fun activities. As you flip through our pages, Rising Creed Boxers wishes you a joyful and interesting visit. Here you can see our girls and our fun loving guys. Our puppies receive a lot of attention and get the socialization they need at a very young age to be a good family dog in their new homes. Our puppies love people and are people dogs. They are raised to be part of your family, in your household where you are their life. You can't ask for a better dog than a boxer. They are the best! reverse brindles, mahogany reverse brindles and sealed brindles. This website is where I started with my boxers. Thanksgiving is a time for family & friends!